I’ve recently signed up for Personal Capital and have already been using the service extensively. 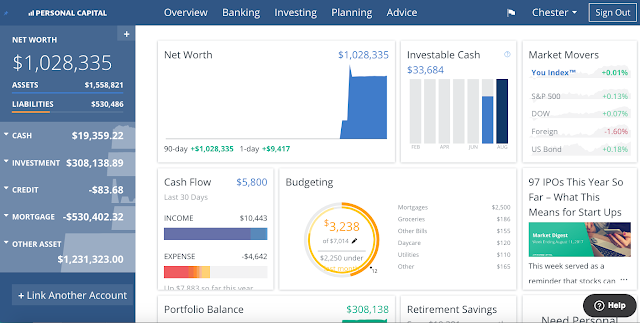 Personal Capital is a financial account aggregator that offers free financial tools to help you manage all of your finances in one place. I’m sure many of you may have heard of it or may already be using it. Think of Personal Capital like Mint.com, but more heavily geared towards tracking your investments and net worth. I've been using Mint.com since 2007 and I love the simplicity of automatically tracking your expenses, income, investment returns, home value, etc. Keeping track of my credit card charges through Mint has helped me catch a few small fraudulent charges over the years. Mint is free and I regularly recommend the service to anyone interested in keeping an eye on all his or her financial accounts in one place. I've also recommended using ClearCheckbook as a manual way to balance your banking, credit card, and investment balances. Some people find manually keeping track of finances to be a pain, but I feel like it helps me keep an idea of what is going on with our expenses. After all, if you don't know how much money you need to live off of, how will you know how much money you need in the future for retirement? I use this service daily to track my expenses and financial account balances. ClearCheckbook is free. Anyways, let’s get back to Personal Capital. I've put off signing up for the service for a while, because I didn't want to mess around with yet another financial tracking app. Mint and ClearCheckbook already do such a good job of tracking all of my bank accounts, investment accounts, home value, and rental property value. Mint also does a great job helping us create and stick to a budget. Where Personal Capital really shines is analyzing and managing your investments. When compared to Mint or ClearCheckbook, Personal Capital offers superior tools for managing your investment portfolio. Personal Capital’s features really impress me. When you login, the dashboard provides you with your complete financial snapshot. You can see information about your cash flow, budget, investable cash, investments, credit card debt, mortgage(s), and property values. An excellent overview of our finances. The mortgage tab includes our personal home mortgage as well as our rental property mortgage. The other asset tab includes the value of both our home and our rental property. I totally get why over 1.4 million people use Personal Capital to track over $350 billion. I can see why so many financial bloggers highly recommend the service. Personal Capital offers a ton of information regarding your investment portfolio, asset allocation, investment fees, tax optimization and projected retirement. Signing up for Personal Capital and using the tools and resources offered is completely free. When I was tracking our investments with Mint, I could only see the account balances in our different investment accounts. 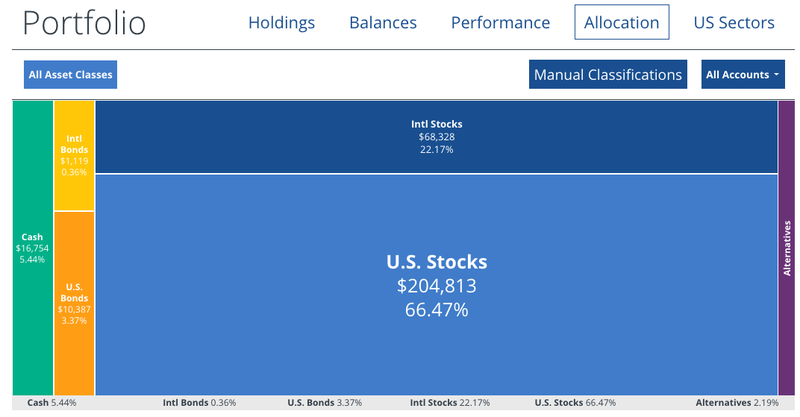 Every time I wanted to check on our exact asset allocation, I would have to manually pull all the information out and calculate everything by hand – that gets tedious and annoying. Once I signed up for Personal Capital and linked all of our investment accounts, I could instantly see our exact asset allocation. Seeing this information helps us better keep track of and rebalance our asset allocation. This chart tells me that it’s time for us to load up on more bonds and international stocks. Our investments are mostly in the Boglehead 3-fund portfolio. This portfolio includes a piece of over 3,600 US stocks (Apple, JP Morgan Chase, Google, Chevron), over 5,500 international stocks (Nestle, Toyota, HSBC), and over 6,300 individual US bonds. Homeowners and landlords can plug in their home address and Personal Capital will automatically use Zillow to add your property value into your net worth. Personal Capital can also track your student loans, mortgage, credit cards, checking and savings accounts. I recommend married couples share the same login and information since you can get a big picture idea of how much the both of you are worth together, and see what's going on with your combined your incomes, credit card spending, and investment portfolios. The Personal Capital retirement planner is very easy to use. You input your investments, savings, risk tolerance, desired monthly expenses in retirement and your desired retirement age. The retirement planner allows you to add large upcoming expenses such as a home purchase, or college tuition. You can also add income events such as projected Social Security distributions, rental income, pensions or inheritances. The retirement planner then calculates your likelihood of successfully retiring when you want to. It’s nice to step back and get a big picture look at your odds of successfully retiring when you want. We still have a lot to work on with our retirement. 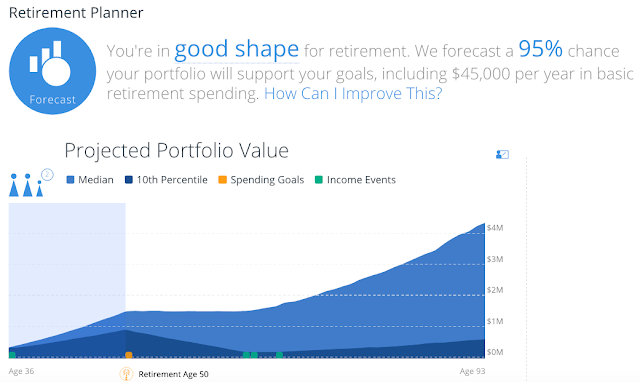 I'm still playing around with the retirement calculator - it's actually a lot of fun. The retirement planner allows you to adjust your savings rate and annual expenses, providing instant feedback on how those changes affect your retirement and allowing you to check if you are on the right track for your retirement. No matter your financial situation, the retirement planner can help build a detailed plan for your retirement. Personal Capital displays beautiful graphs and charts to help you visualize your investments and asset allocation. The software and interface are easy to use. The iPhone app is great as well. 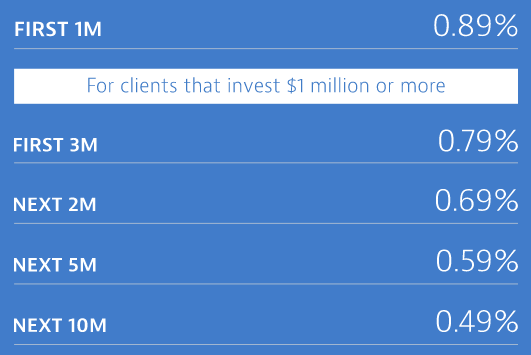 Once you hit 100K of investable assets, a licensed financial advisor from Personal Capital will call and see if they can schedule a free telephone consultation. During this phone call, the financial advisor will take the time to discuss your financial goals and questions. The financial advisor will discuss ways to improve your portfolio, reduce your fees, and optimize your taxes. There is no obligation to speak with them but it may be nice to get some input on your personal financial situation. This phone call is free of charge. There are 3 levels of account management: Investment Service (up to 200K in investable assets), Wealth Management (200K to 1M in investable assets) and Private Client (over 1M in investable assets). These levels of management offer features such as 24/7 call access, 401K advice, college savings, estate planning, private equity review, hedge fund review and more. While Mint.com and ClearCheckbook.com are great for tracking your finances and sticking to your budgets, Personal Capital excels at tracking your investments. This is especially helpful when your investment account balances start growing into significant values. There is definitely a place in your financial toolbox for Personal Capital. I highly recommend checking out Personal Capital and playing with the investment analyzer and retirement planner. You can sign up for your free account here. I am an affiliate for Personal Capital. If you sign up from a link on this page, I may receive compensation.